ROYAL PAPER Royal Paper Sandwich Pick 3.5 In Wood, 10000 CS by Royal Paper at Marion Street Deli & Pub. MPN: 2379187. Hurry! Limited time offer. Offer valid only while supplies last. Simple can be stylish with our Wood Sandwich Picks. Their smooth and sleek surface offers a clean and elegant design, and safe handling for staff. Simple can be stylish with our Wood Sandwich Picks. Their smooth and sleek surface offers a clean and elegant design, and safe handling for staff. Convenience is crucial in any busy kitchen. 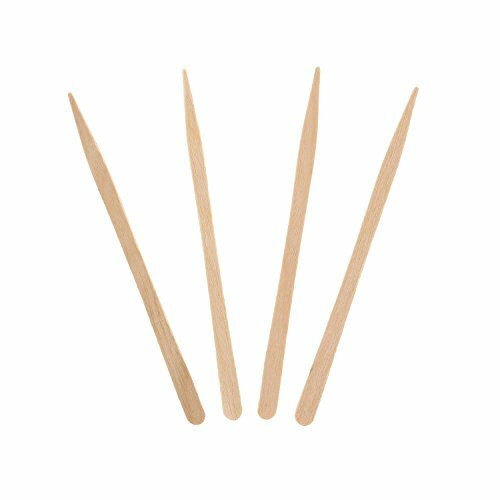 Our Wood Sandwich Picks are a one-time use item, offering you the ability to save time without the need to wash reusable picks or skewers. They are disposable, and can be thrown out with your kitchen's food waste/compost. Perfect for spearing sandwiches, burgers, or wraps, this product helps to hold messy or large food items together. PERFECT FOR burgers, sandwiches, subs, and wraps. These durable wooden picks hold together sandwiches and keep toppings in place. They are 3.5" in length; the perfect length for many foods. A must have item for any deli, sandwich shop, or restaurant! VERSATILE! These wood sandwich picks are a cost effective way of serving appetizers or garnishing drinks. Simply spear small pieces of food and create a display on a tray or platter. Garnish drinks by spearing fruit, olives, or candy with this pick! BIODEGRADABLE! This product is completely biodegradable, and can be thrown out with food waste. It is a one time use item, making it convenient for use in busy restaurant kitchens. As a product that is both single use, and compostable, these picks are the perfect balance of eco-friendly and convenient. SIMPLE AND ELEGANT APPEARANCE! These picks are made entirely from UV treated wood. They have a rounded top, and pointed end. The pointed end is perfect for easy insertion into sandwiches or burgers. The rounded top allows for safe and easy handling by restaurant staff. This pick is flat in shape. CONVENIENT and SANITARY: This product is a one-time use item. As a disposable item, they help reduce the time required to clean up after events or parties, or in restaurant kitchens. One-time use items can be a more sanitary alternative to reusable items. If you have any questions about this product by Royal Paper, contact us by completing and submitting the form below. If you are looking for a specif part number, please include it with your message.